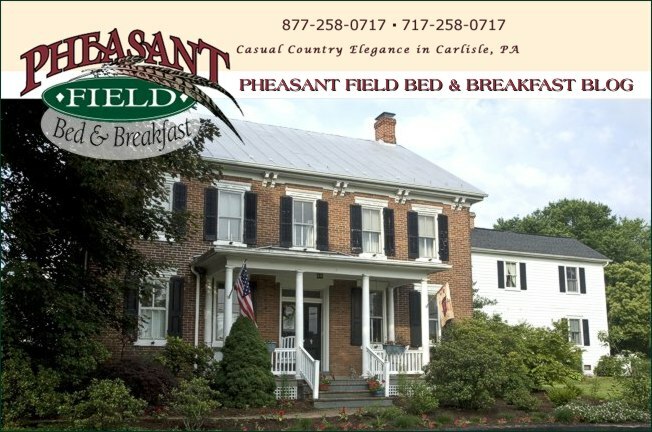 We love hosting canine guests here at Pheasant Field Bed & Breakfast! The pups ictured here stayed with us recently, ran around our big lawns, and even hiked on the nearby Appalachian Trail. Remember that you can bring your canine family member with you on your next visit to the Carlisle area. We have a new resident here on the farm! On Saturday, Cody came to live with us. Cody is an 11 year old Quarterhorse gelding. He will be ridden by a young girl and her mom. Cody is spending his first days here meeting the other equine residents of Pheasant Field and getting lots of attention from the humans who visit the barn. The flowers are blooming around our property; Robins have reappeared in our area; The spring "peepers" just started their chipping tonight. It really must be SPRING! More information on spring time happenings is available from our local visitors' bureau.